Here is where you find all the essential information about this particular bill. 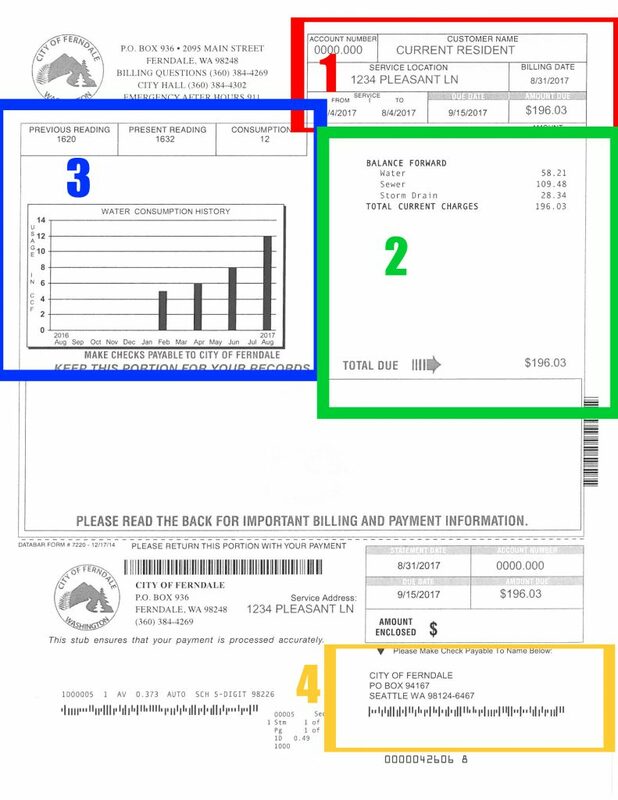 The Billing Date is when the bill was mailed, the Service From and To are the dates when the meter was read, and the Due Date is the last day you can pay your bill without late fees. We bill every two months. You can find the billing schedule here. Balance forward is any leftover charges from the previous cycle. For more information on how your water, sewer and storm drain is calculated, please click here for details. For current utility rates, please click here. Here is where you find your Water Consumption History. It is measure in water units. One water unit is 100 cubic feet of water, or roughly 748 gallons. The average water use per customer in 2016 was 11.3 units of water per billing cycle, with an average low of 9.7 units in December and a high of 13.2 units in October (due to summer irrigation). This is the address where you can mail your water payment. We use a third party vendor for our mail payment processing, hence the Seattle address. You can also pay in person at City Hall, online or over the phone. Learn how by clicking here.